Storey Publishing, LLC, 9781612129785, 224pp. This trusted handbook is a must-have for novice and seasoned beekeepers alike. Now totally redesigned and featuring color photos and graphics, the second edition also includes up-to-date information on honey bee health. 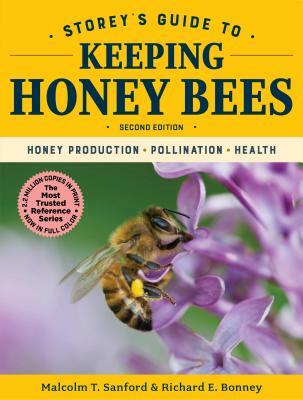 The go-to reference presents comprehensive yet accessible information on everything from planning hives and installing a colony to preventing disease and managing productive hives that will bear bountiful honey harvests year after year. Dr. Malcolm T. Sanford is professor emeritus at the University of Florida. He has been published extensively in the apiculture press including the journals Bee Culture and American Bee Journal. He has been the author of The Apis Newsletter for more than 20 years at Ohio State University and the University of Florida, writing on beekeeping management, and is the coordinator of the Apis Information Resource Center. He has been a beekeeping management consultant in Egypt, Italy, France, Chile, Ecuador, Iraq, and Mexico. He lives in Gainesville, Florida. Veteran beekeeper Richard E. Bonney, author of Hive Management, Beekeeping, and co-author of Storey’s Guide to Keeping Honey Bees, was the longtime owner of Charlemont Apiaries in Charlemont, Massachusetts.